One of Barry Blyth's introductions that in my opinion is completely underrated. A fantastic late flowering Amoena, that has remained under the radar probably due to the date of its release which preceded the internet age and the ease of digital photography so missed the publicity that it justly deserves. An excellent garden Iris that grabs visitors attention . High health, good increase, great bud count and branching, it is without doubt a must have in anyone's garden. Quality all round. Tall Bearded Iris, New Introductions for 1986/87. ORIENTAL ALABASTER (B. Blyth, R. 1986). Sdlg. Q108-A. TB 38" (97 cm) M-VL. S. creamy white, flushed apricot at midrib; F. smooth creamy apricot; red tangerine beard; ruffled. Cameo Wine X (Love Chant x Festive Skirt)., Tempo Two 1986/7. Sold in New Zealand by Richmond Irises, in Australia it can be purchase from Yarrabee Garden and Iris, and I am yet find who sells it in America if someone knows please leave the information as a comment. If I were only allowed to grow 10 irises this would be near the top the list. "Majorette" a strong grower that shows good increase. Bloom is bright and exciting for an almost Plicata that is both different and pleasing. 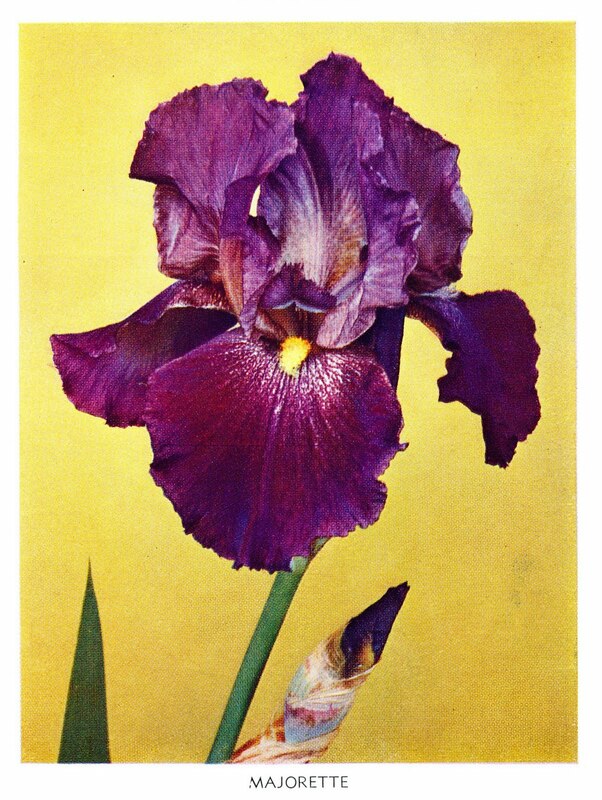 When this Iris was first listed by Lyons Iris Gardens in America, it sold for the princely sum of $14.00. Can't say for sure who still sells this Iris in New Zealand but if I find out I will adjust this post later. Lyons Irisland, 1955 Catalog, Lyons Iris Gardens, Van Nuys, California. Vivid in coloring, unusual. Light medium red-violet shading to deep red-violet on the fall petals, white beard, white plicata markings on the shoulders- these points have special charm. Flaring falls, graceful ruffling. Mid-season 36" (Golden Gleam X Wayfarer) Honorable Mention 1954. Region 14 Northern California, Nevada, Regional Bulletin, Spring 1958. Varietal Comment, Mildred B. Maris, Live Oak, California. Region 14 Northern California, Nevada, Regional Bulletin, Fall 1958. Varietal Comment, Mary Ollmann, Menlo Park, California. MAJORETTE (Miess '53) After three seasons I have decorated it with my own medal for performance beyond the call of duty. Even the fine foliage seems to resist spot and rust. Iris Colorama Catalog,1961, Marble Iris Gardens, Grandview, Washington. MAJORETTE (Miess 1953) HM, 38"
An unusual Iris of red violet with a lighter area around the beard. This bicolor is soft and loverly with a richness and quality that is sure to please every iris grower. H.M., 1954: A.M., 1956. MAJORETTE (Miess, R. 1952). 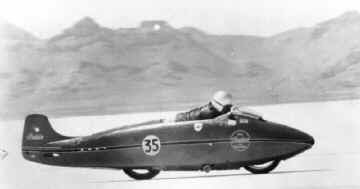 TB 36" M. RV3. S. rosemary (M & P 44-H4); F. deep maroon (M&P 47-L7), or light medium red-violet and deep red-violet. (Name released by Mrs. Mary Tharp.) Golden Gleam x Wayfarer., Syllmar 1953. HM 1954; AM 1956. Photo taken at home this morning. Its good to get the view of hybridisers concerning their introductions and Paul sent me these comments on 'Announcement' in an email this morning. "I've been very pleased with 'Announcement' both in the garden and in the AIS awards system. It received an AM in 2006. It has been very consistent in formation of the appendages. It also opens the flowers without distorting the falls which happens often with space-age irises. It also forms a relatively tight clump which I also like." $SOLD OUT last season at Mid-America Iris Nursery so look forward to it next season if you live in America.Not listed this current season with any New Zealand Iris grower that I have received a catalogue from. AZURITE (Sass-Plough, R. 1959). Sass, Sdlg. 53-6. TB 34" M, W2V. White ground with methyl-violet stitching, Moorish blue styles and crest. Sass 49-59 x Dancing Waters., Eden Road 1960. Iris variegata 'var.Reginae', collected in Hungary in 1947 but I am most sure that this natural clone has been around many century's before the date it was collected. There must be huge amounts of these types of Irises in parts of Europe and Russia that western gardeners are still oblivious to. Plant is about 40cm tall and the flowers size is approx. 6cm in height. Flowers just above the foliage and usually bears two or three lateral heads. Glaucous green ribbed foliage. It's one tough little plant. Super species type for Heritage gardens. I have no idea where this plant can be purchased from in New Zealand. First bloomed for me at home 4 days ago,and what a top surprise. 'PRIZE LADY' was given this name by Noel Lapham because as you can see in the checklist description it had won a CM in 2005. Please don't ask me what a CM is but it seems a obscure Award for such an outstanding Iris. 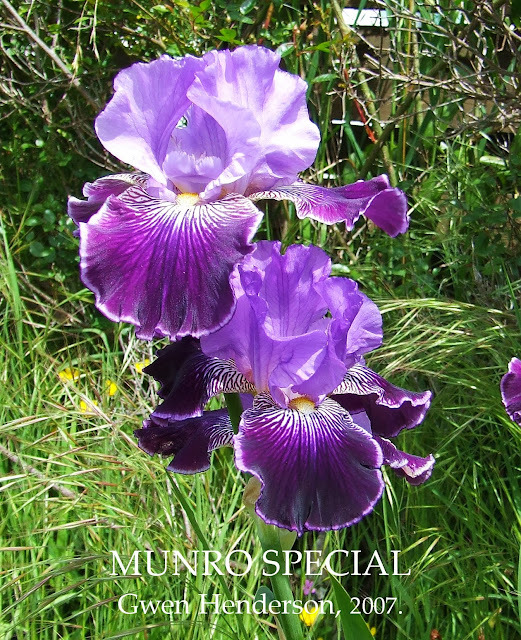 One would think this amazing Iris is been considered for New Zealand's Highest Iris Award. It is my opinion (and that's what this blog is) that this iris is of a international standard, more than a match for imported varieties, showing high health, good increase, height, great bud count,and edgy colour tones. Fertility unknown. 'Broken Dreams' the pod parent has traits of broken colour but it seems to be seasonal and is some what erratic and inconsistent and this can be on the same plant in the same season. Reminiscent of that stable broken colour Tall bearded Iris of the 80's "Maria Torena" (Allan Ensminger '87) which is an Iris I admire a lot. Purchased this iris last year from 'The Iris Garden' only because it was reasonably priced. After flowering I have come to realise that with a $8.00 price tag this iris is more than just great value. I would recommend this impressive iris to everyone so get your order in before Julie runs out!! Tempo Two, Pearcedale, Victoria, Australia. Iris, Daylilies, Hosta Catalogue 1994-1995 CRYSTAL GLITTERS. 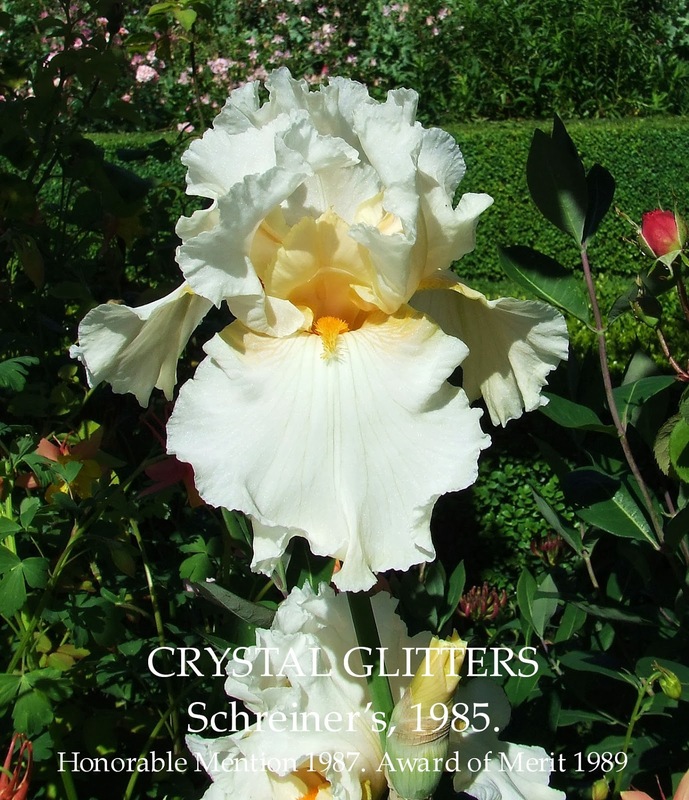 (Schreiner's 1985 USA) EM 36"
A warm glow of pink and peach highlights the creaminess of this iris.Lovely form and superb branching. 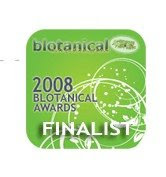 We are most impressed with this variety. (Moon Glimmer X Gold Trimmings) X (Inferno X Brimstone) HM 87. AM 89. CRYSTAL GLITTERS (Schreiner's, R. 1985). Sdlg. S 871-2. TB 36" (91 cm) EM. Lightly ruffled pale peach cream; darker peach pink hafts and styles; peach gold beard. K 814-A: (Moon Glimmer x Gold Trimmings) X K 711-2: (Inferno x Brimstone)., Schreiner's 1985.